Cloud computing is a model for delivering IT services in which resources are retrieved from the internet through web-based tools and applications rather than a direct connection to a server. This allows companies to avoid up-front infrastructure costs (e.g. 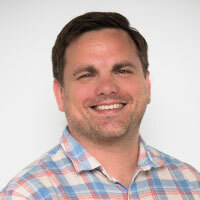 purchasing servers), as well as enabling organizations to focus on their core businesses instead of spending time and money on computer infrastructure. Worldwide spending on public cloud services and infrastructure will reach $122.5 billion in 2017, an increase of 24.4% over 2016. By 2020, IDC forecasts public cloud spending will reach $203.4 billion worldwide with Software as a Service (SaaS) remaining the dominant cloud computing type, capturing nearly two thirds of all public cloud spending. With the world’s biggest and best attended cloud event Cloud Expo Europe having recently taken place on 15th – 16th March, we were keen to analyse the online conversation, identify the key influencers and look at what they are saying. 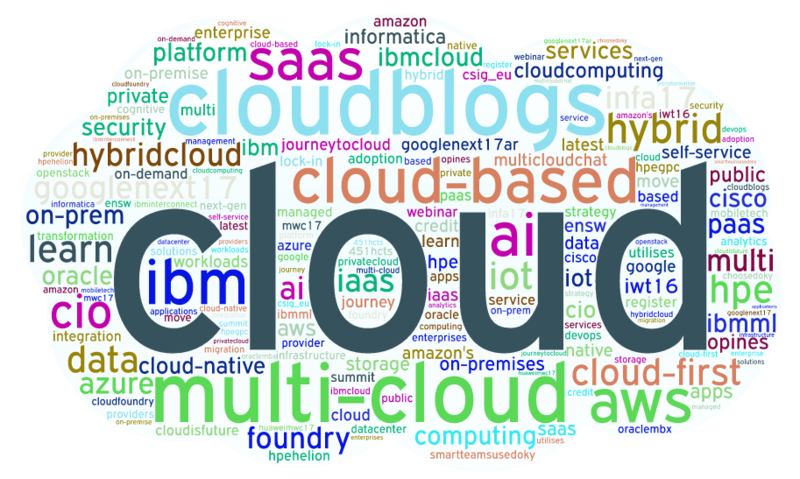 We were very interested in seeing which brand and individuals were leading the discussion around cloud, so we analysed over 994K tweets mentioning the key words: “cloud OR cloudcomputing OR hybridcloud OR privatecloud OR publiccloud OR thecloud OR cloudstorage OR “cloud storage” OR #saas OR #iaas OR #paas” from 16th December – 17th March 2017. We then identified the top 100 most influential brands and individuals leading the discussion on Twitter. What we discovered was a very engaged community, with much discussion between individuals and brands. 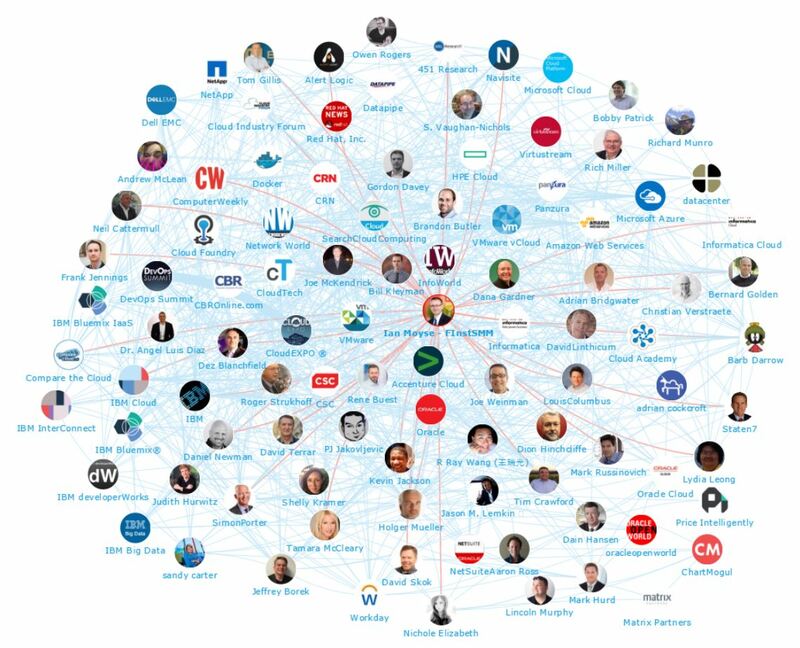 Below you can see a network map of the online robotics conversation with the number one influencer Ian Moyse at the centre. This map was created with our Influencer Relationship Management software (IRM). Be sure to click on the map to enjoy the full size network diagram in greater detail. Below you can see another network map created with our Influencer Relationship Management software (IRM) showing the number 1 brand VMWare at the centre and all the robotics conversations to and from the influencers in their field. If you are interested in learning more about identifying, managing and engaging with influencers click here to get in touch! It’s interesting to see topics such as “multi-cloud”, “cloud-based”, “enterprise”, “platform” and “SaaS” being frequently mentioned among the top cloud influencers and brands, illustrating the industry forecasts that SaaS is the dominant cloud computing type. Top brands being mentioned in the context of cloud include AWS, IBM, Oracle, Azure, Informatica, Google, Cisco and HPE. Also interesting to note is that AI and IoT are being frequently mentioned by the cloud influencers and brands, illustrating the importance of incorporating IoT and AI into future cloud based applications. 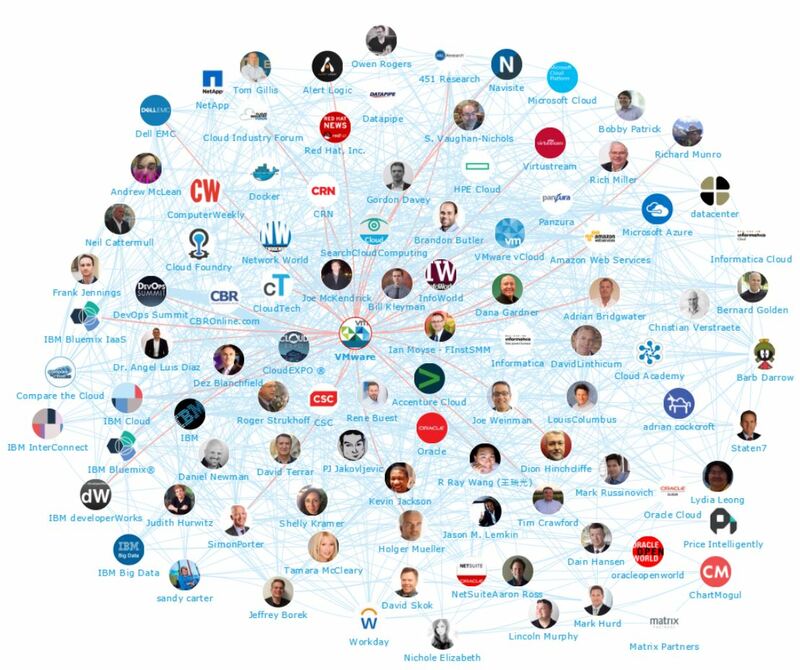 We looked at all the individuals engaging on Twitter to bring you a list of the top influencers in cloud. Below is the top 50, if you want to see who ranks from 50-100 be sure to download the full report by clicking the download button below. 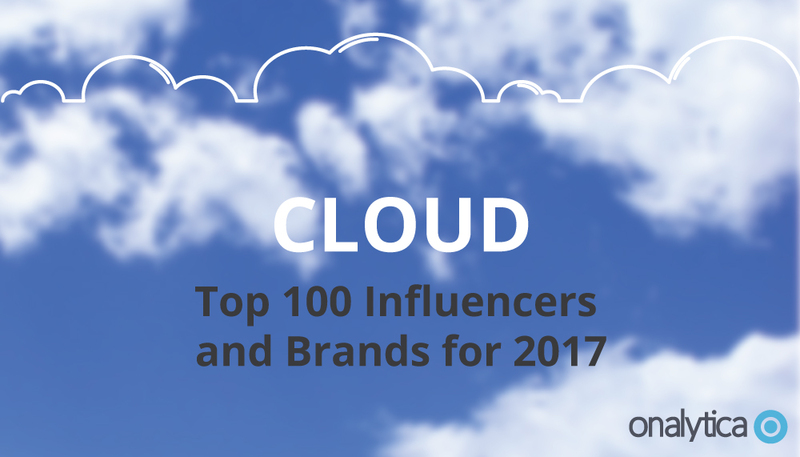 We also looked at all the brands engaging on Twitter to bring you a list of the top brands talking about cloud. Below is the top 50, if you want to see who ranks from 50-100 be sure to download the report to get the full top 100 list, and see who are most the influential brands in cloud. At Onalytica we love building these lists and want to give back to our loyal readers as much as we can. If you’re interested in other topics (such as Virtual Reality, Digital Health, Digital Marketing) be sure to have a gander on our blog or why not propose some topics to us on twitter? We also build some very cool software to manage all of these influencers. Get a free trial today by clicking the button below! Disclaimer: As ever with these lists, it must be stressed that the ranking is by no means a definitive measurement of influence, as there is no such thing. The brands and individuals listed are undoubtedly influential when it comes to driving discussion around Cloud computing.